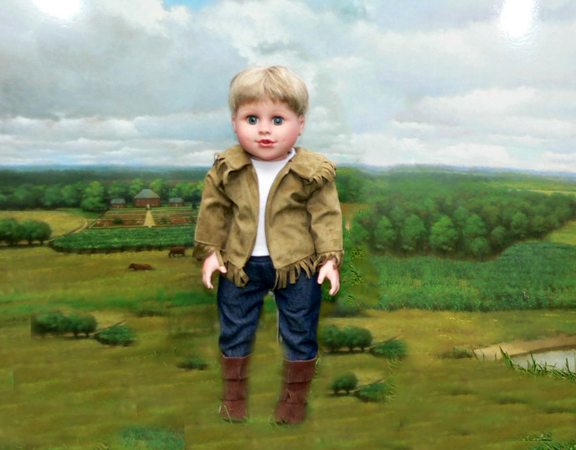 Dolls For Boys: Boy Dolls, Adorable 18 Inch Boy Doll Clothes & Accessories From Sew Dolling! Boy Dolls, Clothes & Accessories & Bed ! THE BOY DOLLS ARE FINALLY HERE ! 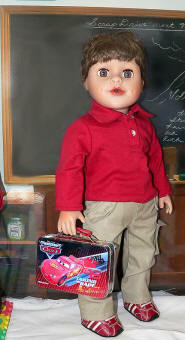 All of our 18 inch tall boy dolls have their own personalities. 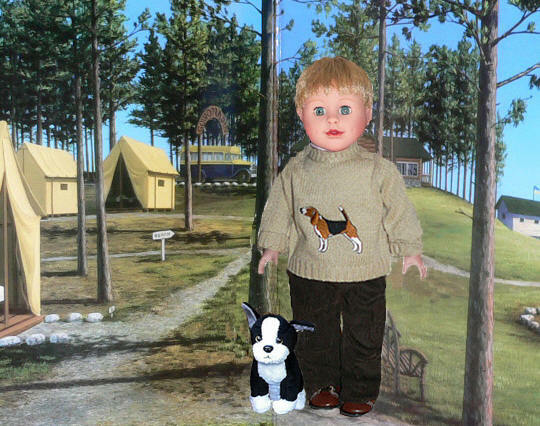 Each one likes to pick out his own clothes depending on his mood so be sure to check on some outfits here to bring along with them on the way to their new home. 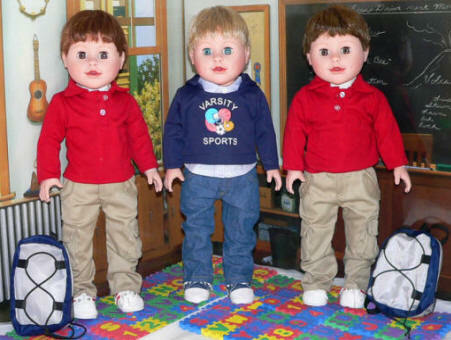 They wear the same size clothes that fit any 18 inch doll. The New Rowdie Boy™ Doll Collection has arrived!! 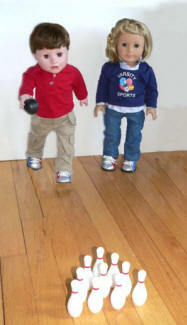 These 18 inch tall boy dolls are excited to be brothers or friends to the girl dolls! After an extensive delay in Customs, they have finally arrived! Some of them were having a snack just now, but most of the boys went outside to play. They are loud and rowdy so the Adoption Center has created a huge play area for them outside to play football, soccer, basketball, or just get rowdy! Others are still inside jumping around here with excitement as they have been waiting a long time (and not too patiently) for someone to adopt them! Each 18 inch tall boy has sleep eyes and will come with a complete outfit and an official Adoption Certificate signed by the Rowdie Boys™ Adoption Center. 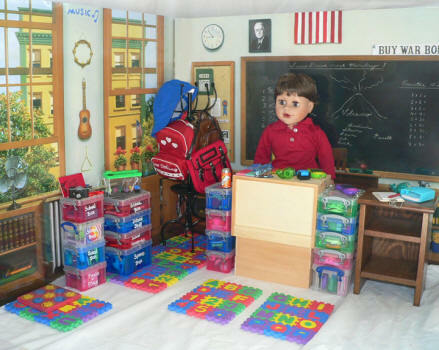 There is a space for YOU to name your own boy doll and a space for you to sign your name on the day you adopt him. You may want to frame it so you don't lose it. 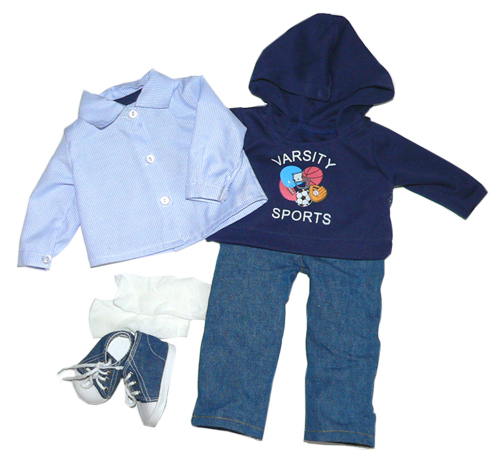 The outfits vary - one has a Varsity Sports Sweatshirt, Blue and White Striped Shirt, Blue Jeans, Underwear, Socks, and Denim Shoes. The other one has a Long Sleeve Red Shirt, Tan Cargo Pants, Underwear, Socks, Red and White Striped Sneakers, and a Backpack. These boys are world travelers now. 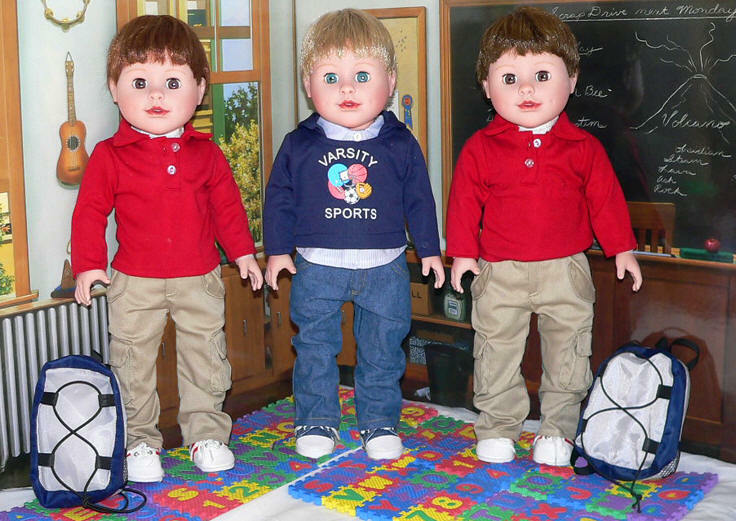 Above, left to right, are Alex, Christopher, and Jason. 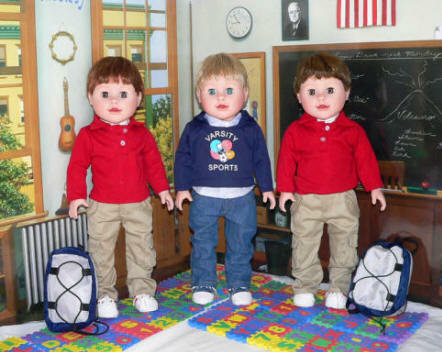 They are just three examples of the boys waiting to be adopted. 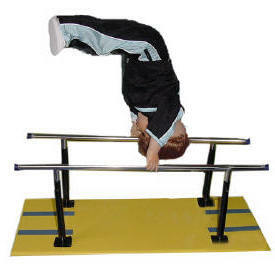 Alex has Auburn hair and Brown eyes. 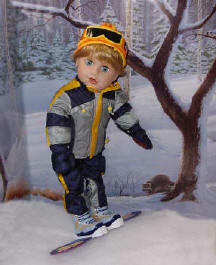 Christopher has Blond hair and Blue eyes. 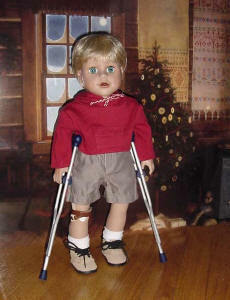 And Jason has Brown hair and Brown eyes. They sure are cute! Their friends (same features) were out playing when these three ran in for a cookie, so we took their picture quick before they ran back outside. They are all wishing for a new mommy or daddy this year. 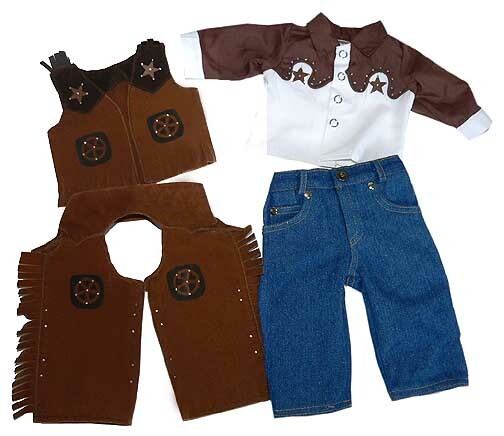 MOST of the Outfits DO Include SHOES, BOOTS, etc. MORE BOY DOLL OUTFITS COMING SOON!!!! 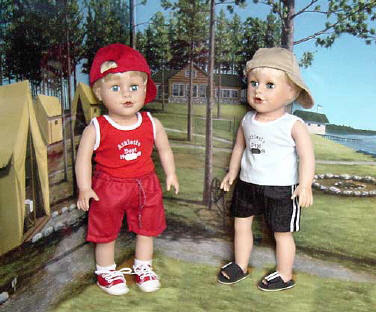 Boy dolls need clothes and accessories too! 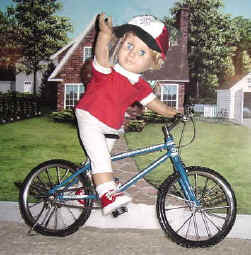 Items on this page were made to fit our boy dolls as well as most of the popular 18 inch dolls including the American Girl® Doll. He is just a little thinner than the American Girl® Doll. We couldn't leave the boys out! 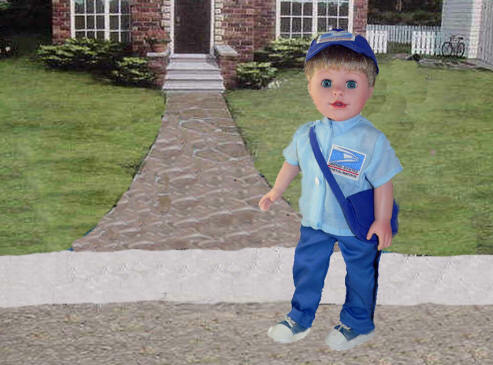 This outfit has all the pieces your doll will need to become a postal worker. 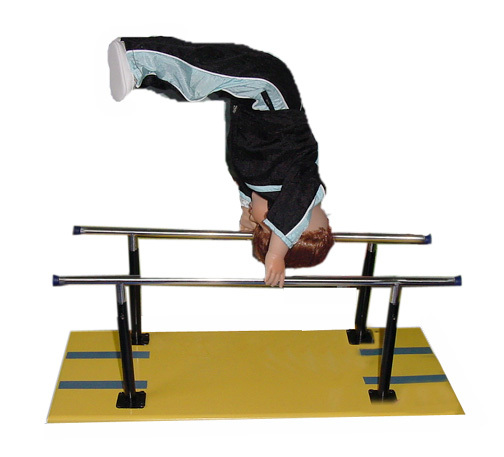 Whether it is for your boy doll or girl doll, this will fit fine. 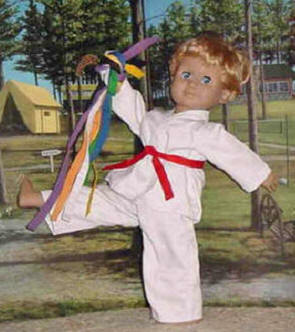 The outfit includes a light blue shirt that Velcro's down the front with buttons added on for effect. A realistic patch is on the left side with the eagle symbol and U.S. Post Office lettering. The blue baseball cap has the same patch on the front. The blue pants are very nice with belt loops, 2 front working pockets, snap closure and zipper. There is a black stripe down the sides. The mail sack fits over the doll's shoulder and has a Velcro closure. Finally, this outfit includes 2 denim tennis shoes. Pant legs sewn in place (rolled up) with a button that is sewn closed on both sides - just for style. 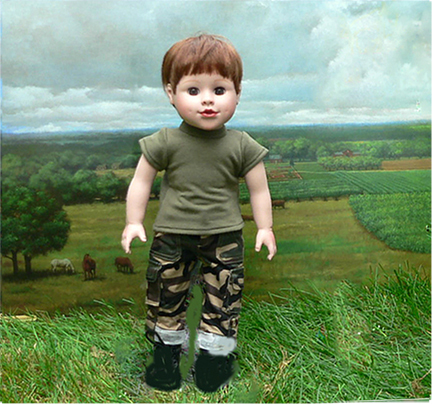 An Army green short sleeve shirt with Velcro in the back. A pair of polished shiny boots complete this set. 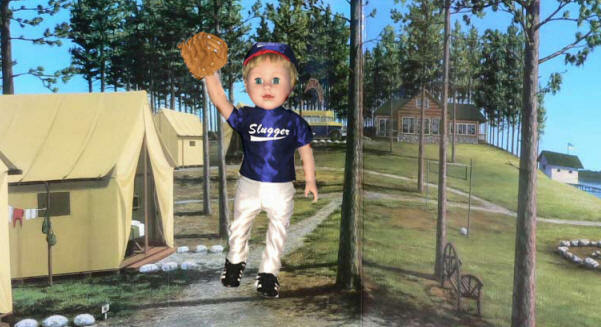 What cool outfit to play in the wild frontier! 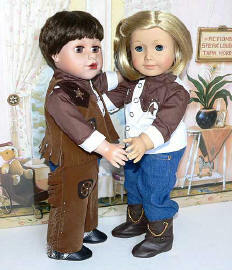 This 4 piece outfit includes the new popular tan faux suede jacket with fringe on the collar, cuff, and hem. Under the jacket, there is a sleeveless white shirt that Velcro's all the way up the back. Jeans accompany the outfit with 2 real front pockets and elastic at the waist. 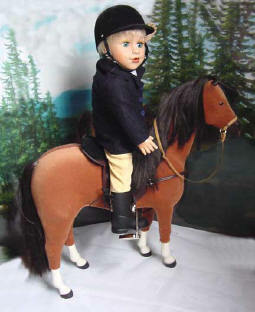 He is ready to go outside with 2 brown double fringed faux suede that zippers up the back to make it easier to put on. Our Rowdie Boy is not included. He is just modeling it, although he wants it. This Varsity outfit has a Varsity Sports Sweatshirt with Hoodie. Underneath the Sweatshirt is a nice Blue and White Striped Shirt, coordinating Blue Jeans, Underwear, Socks, and Denim Shoes. 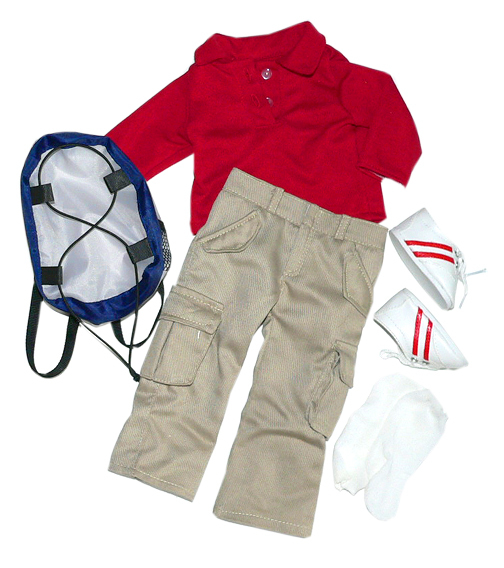 This outfit has a Long Sleeve Red Polo Shirt, Tan Cargo Pants with working pockets, Underwear, Socks (hard to see in photo), Red and White Striped Sneakers, and a really cool Bunjee Backpack. 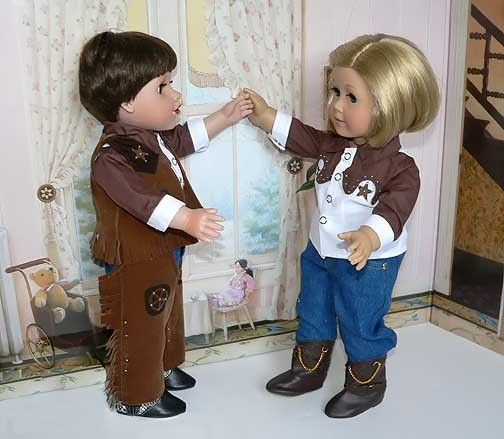 For the Best Dressed Boy Dolls! Finally Arrived! 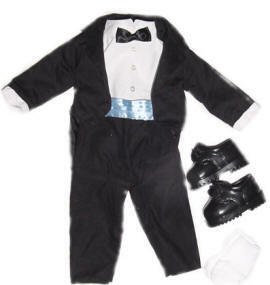 The Boy's Tuxedo has a blue satin cummerbund and white dress shirt with a little black satin bow tie. 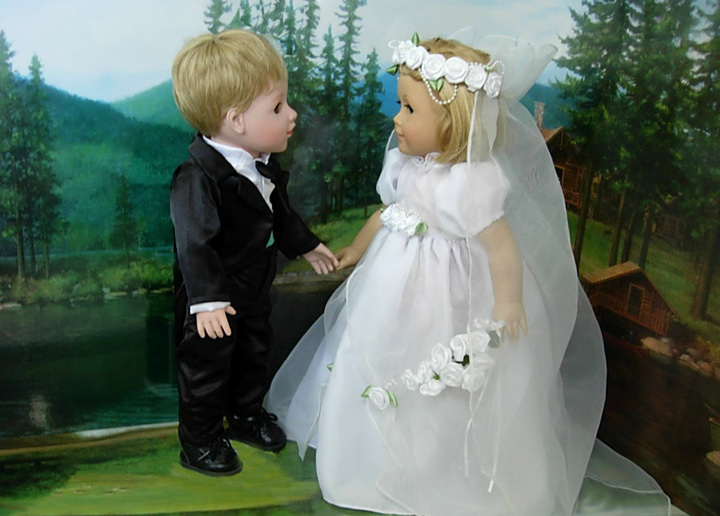 The Tuxedo jacket is quite detailed and has long tails in the back and is short in the front. The shoes are very cute and look just like the real ones. The boys have been waiting for this outfit for quite a long time! Now they can dress to the nines! 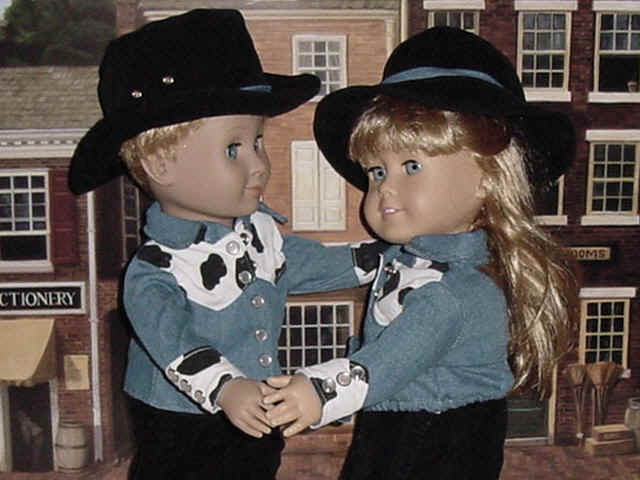 The Tuxedo was made to fit our handsome boy dolls - girl dolls may not fit. The exquisite white wedding gown has an empire waist adorned with three satin white roses and faux pearls. The dress has a sheer overlay pulled back and held in place with 2 more satin roses. 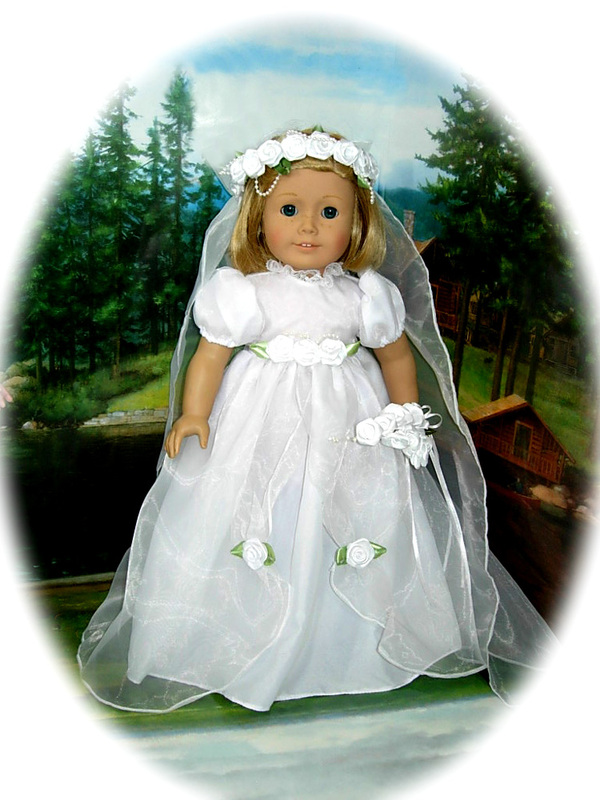 It has puffy sleeves and the neck is adorned with lace. Also included is a ribbon bouquet with 9 white satin roses tied together with white ribbon and a small elastic loop to hold onto. Her extra long sheer veil has a garland of roses and faux pearls all around the headpiece with a small cluster of 3 roses in the back. 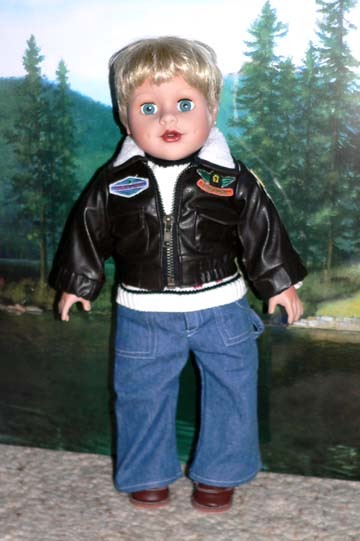 This is a great outfit for the Rowdie Boys™ or a thinner doll like Magic Attic size 18 inch doll, It will NOT fit the 18" American Girl® Dolls who are a bit bigger around. 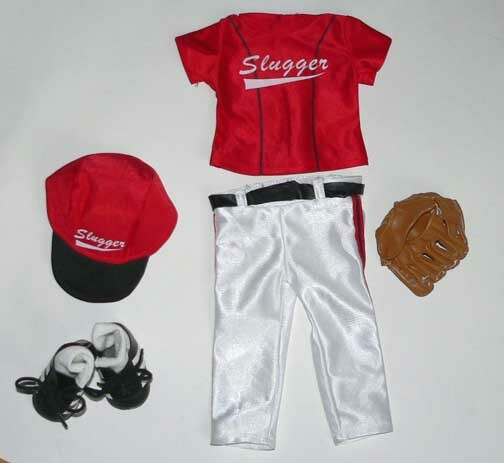 The outfit includes a pair of white pants with racing stripe down the side, a cute Slugger Baseball Shirt that Velcro's in the back and a matching Slugger Baseball hat. 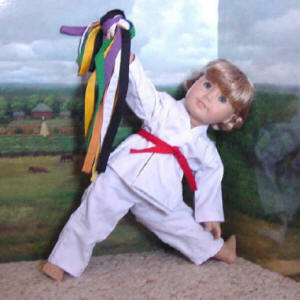 I'm not that fond of the belt but you can use it or not. Another great feature to this outfit is that we are adding a real-looking baseball glove. 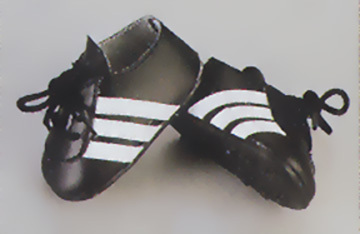 We can't forget a pair of cool soccer shoes and socks. 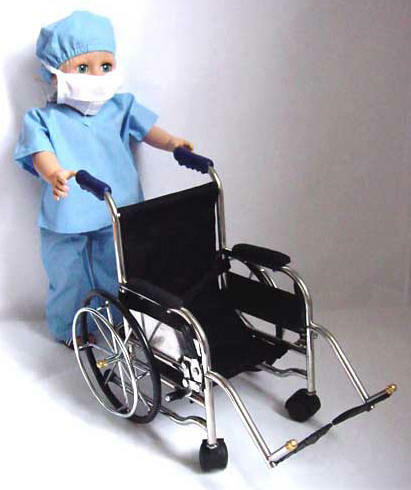 This makes a great gift for anyone with an 18 inch boy doll. Blue, not red as shown below. This is a realistic looking set. 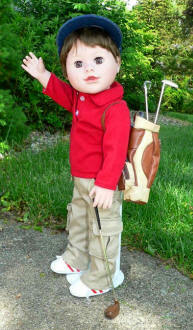 The faux leather bag can be easily carried by your doll as he or she heads out to play golf. It has a long zipper down one side of the bag and a short zippered pouch on the other side. 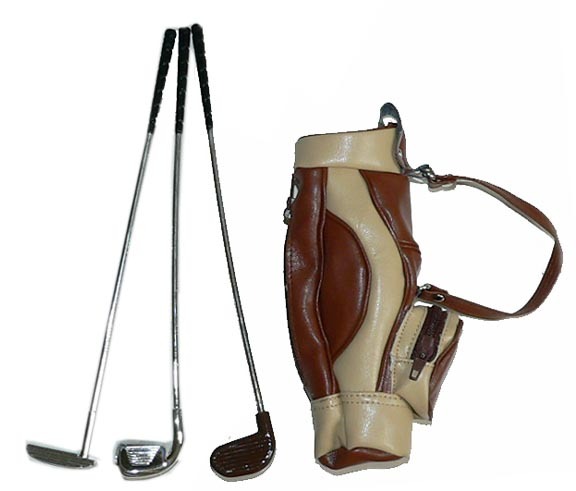 There are 3 plastic golf clubs to go with the bag, each one is 8 inches long, a great size for your 18 inch doll to carry, swing, and golf. 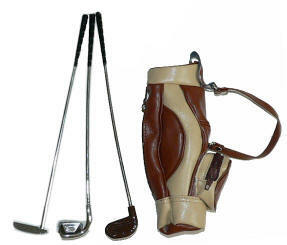 Golf balls not included in the set. The bag will come in either brown or burgundy depending on stock. 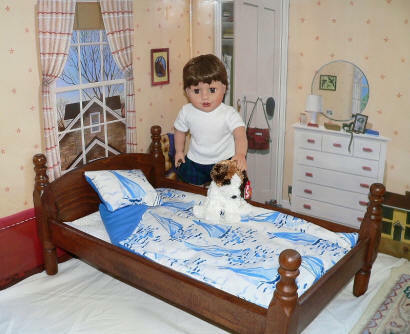 Wooden Bed fits 18" dolls like our Rowdie Boy Dolls! 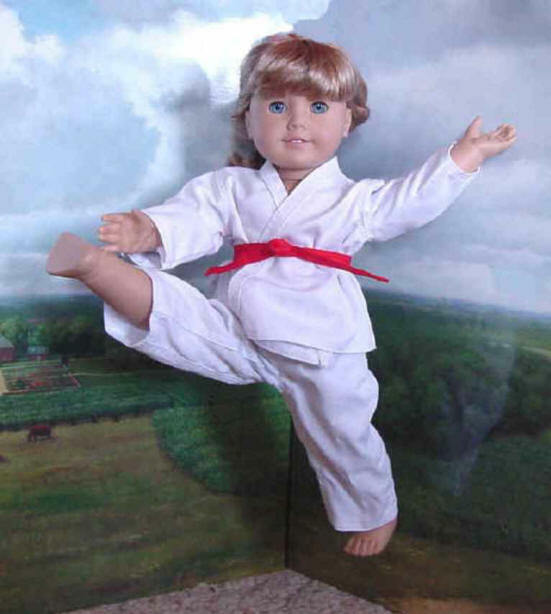 It will also fit American Girl® dolls. This bedding set is geared toward boy dolls and includes a Mattress, Reversible Coverlet with a Sailboat Design on one side and a cool Ocean Blue color on the other side. The pillow is reversible as well. Boys need a bed too! 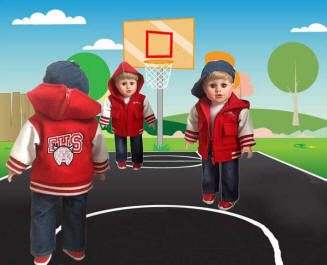 Our Rowdie™ Boys are a little bit fussy about being comfortable! 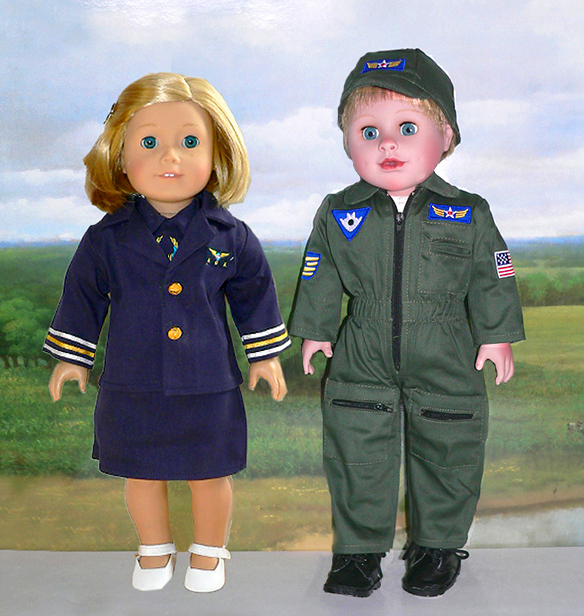 This adorable Flight Uniform includes a full length flight suit with a patch on each arm and also two on the front. The legs have tiny zippers for little accessories and the suit zips up the front. 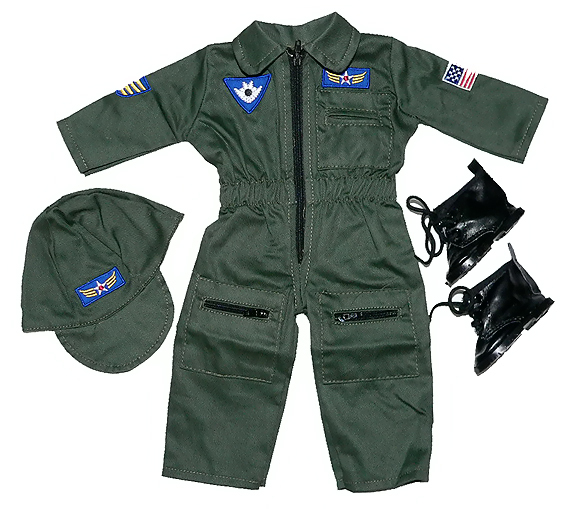 Also included is a cute flight cap with a wings patch on top. The two black boots finish the outfit in grand style. 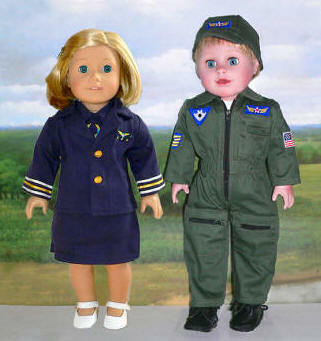 Your doll will be ready to fly in no time! What a set! 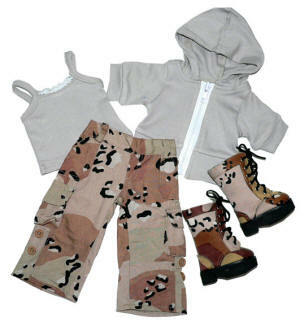 This cool camouflage outfit includes a short sleeve zip up sweatshirt with hood, camouflage pants that can be rolled up or down and will button to keep them in place. They have 3 belt loops, 2 regular pockets and 2 cargo pockets on the side, and 2 buttons to adjust the length of the pants. The girl's set includes a matching tan tank top with lace. The boy's outfit is reduced as it does not include a tank top. 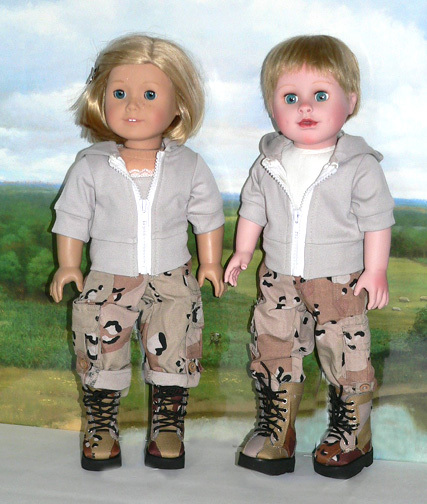 Both sets include the jacket, pants, and camouflage tie-up Boots. A terrific set! 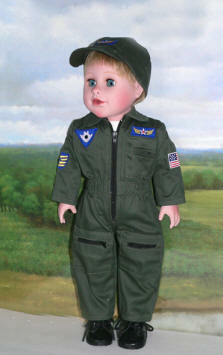 Cutest Astronaut Outfit will fit a boy or girl doll that is 18 inches tall. 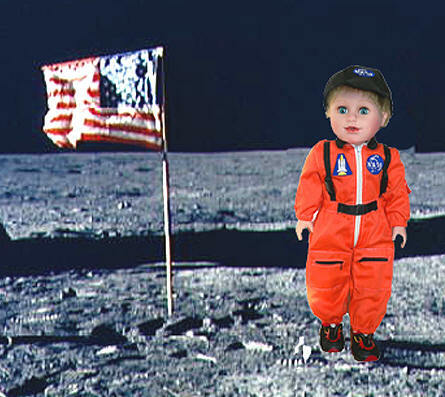 Outfit includes a Cool orange jumpsuit that has 2 working pockets and zippers and another zipper goes up the front. Each sleeve has a hidden pocket on it. The black stripes on the front have clips for the real effect. Patches on the outfit include a Space Shuttle patch that is just too cute! To top it off there is a black hat with another patch on top. The shoes/boots are now black in color, to go with his hat which is also included. 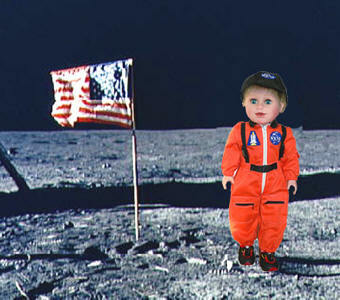 Your boy or girl doll will be ready to be an Astronaut with this adorable outfit. 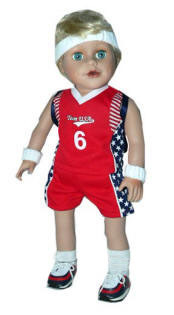 Cutest Outfit will fit a boy or girl doll that is 18 inches tall. 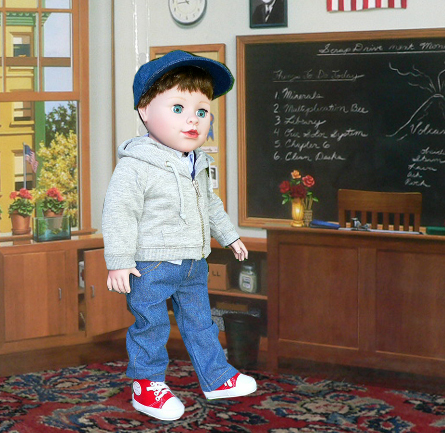 Complete outfit includes a pair of blue jeans (may be darker than shown in photo), cool casual red sneakers (the sneakers are now red tennis shoes instead of high tops), a grey zip-up sweatshirt with drawstrings and pockets on the front and a hood in the back, and a denim baseball hat. New Outfits on the Way!! so don't forget to look there for instruments! Electric Guitar is below on this page. 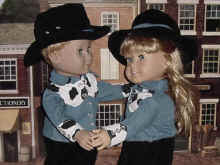 MORE DOLL CLOTHES COMING SOON! Cool Brown Bomber Jacket has a zip up front with 2 pockets on the front and a fold down collar. There are several patches on the front and shoulder to make this look like the real thing. This 4 piece outfit includes a Western Shirt, Blue Jeans, Brown Vest with faux rhinestones and Matching Jodhpurs. 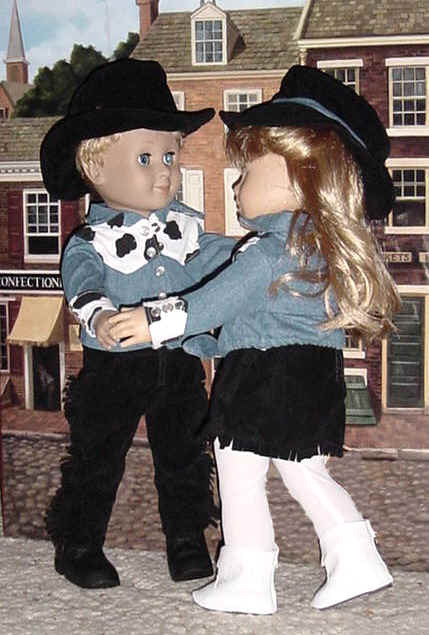 Boots not included - visit our selection of cowboy boots to find some adorable footwear! 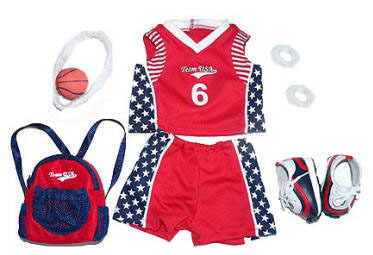 Visit our Sports_Dollight Doll Sports page for Sports Equipment! So cute for this fall! 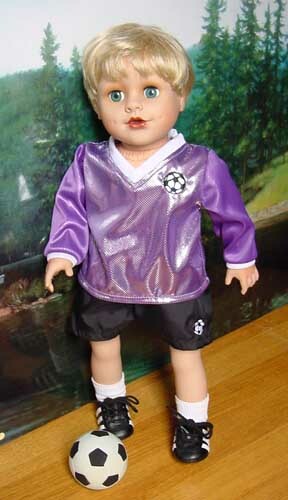 Varsity Soccer Outfit includes a cool purple long sleeve shirt with soccer ball emblem on the front and a v-neck collar, black soccer shorts, and soccer ball. Perfect for any little 18" boy doll. 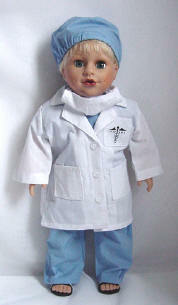 A very cute outfit to dress the boy or girl doll in and pretend they are a doctor. Includes blue pants, blue top, hat, white mask, and a labcoat. 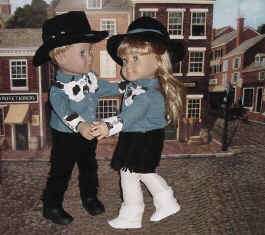 These doll clothes are so cute! 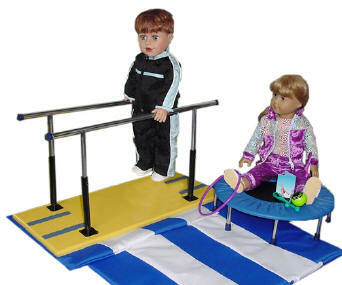 Looks Great on both 18 Inch Boy and Girl Dolls! Various Colored Belts so your doll can improve and move up in skill level. 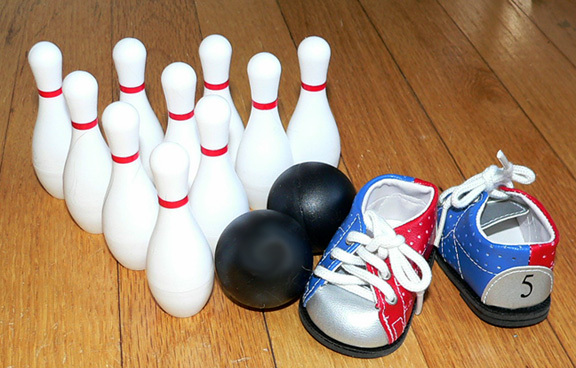 Click on the picture to see a close-up of each item. Pants have a zipper in front and a snap closure. 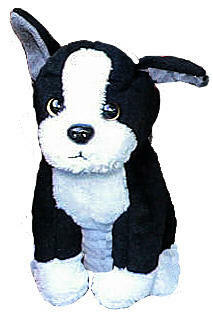 Last, but not least, the new soft black and white (TY® brand) puppy that he just found!